Courtesy of my generous patrons comes Sacrifice to Set: Part 1! This one takes place in the universe of Conan the Adventurer, where the main enemies of the humans are the serpent men of Set. 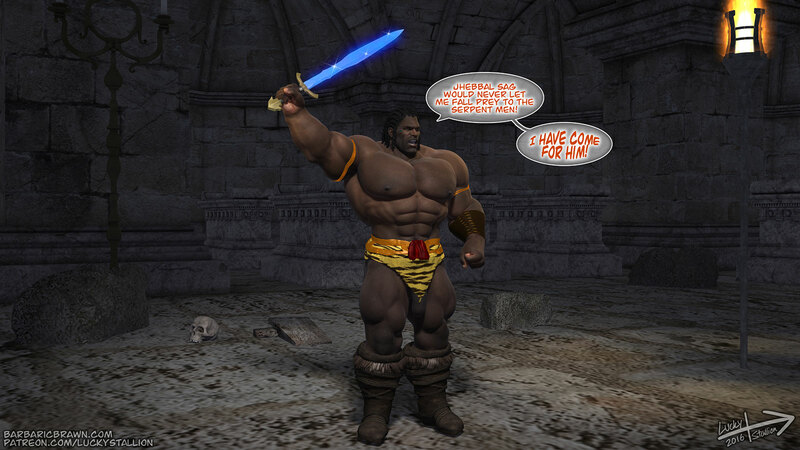 Conan (sporting his updated model) has been conked on the head and brought into the Temple of Set, where the serpent god's physical form stands in stone, eagerly awaiting the day he can escape from The Abyss and wreak havoc on the world. Thank you. :) I really appreciate you guys' support. Would have loved to see the serpent man get fucked, but great piece! Great to hear! Orcs, snake men, human giants... Let's see'm clash, man! Love this short. when they locked up... instantly boned! For me, it would have worked better if Set had wanted Conan's essence, and not his blood. 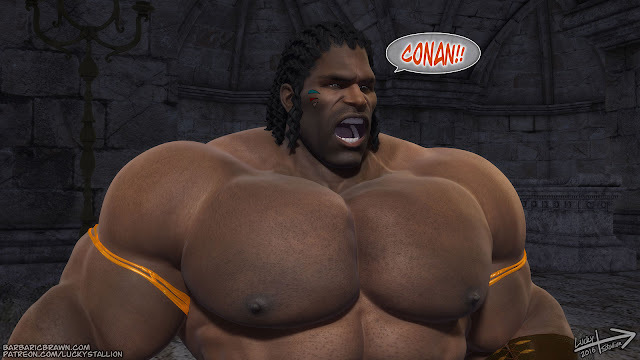 Every drop of Conan's seed forced from him would diminish his strength and virility, as Set slowly becomes reborn. How long could Conan endure, and could a rescuer arrive in time to save him? This one actually started out a bit darker (and shorter) than it ended up being, with Set reviving in the end. I have a couple of panels rendered from that version, but decided to go a different route with it. It would be nice to see the villain win for once, i mean its not like this is canon or something but you can see that rescue a mile away and its cliche to the point of being bad. Then learn to do it yourself, instead of bitching about it. I'm gonna have to respectfully disagree with you here. Have you seen my other stuff? I _constantly_ have the villain winning. I'm trying something different here and there. That isn't cliché. I always appreciate when someone take the time to comment, but yours comes at a rather rough point in my time doing this kind of thing. I know I'm far from where I want to be as an artist, but I am trying. I've seen a lot of extremely talented artists disappear forever because of stuff like this. I'd rather not be one more. 11/20/16 3:12a fuckyougoogle: The Villains have been the Dominant characters in many stories here. For me, I enjoy seeing All characters get what we have thought about many times. Tom of Finland would show an aggressor then in the next panel, that Man would be Dominated by another Man. 11/20/16 3:33a Lucky Stallion: I like seeing Conan being rescued by a Brother and then they get it on a grassy field! Conan is Thankful! Both Men desire to explore each others Bodies! It can be Forced, Consensual or just Hot Manly Action! Awesome work you've got here! Really makes my day! Thanks, Ben! I appreciate that and your taking the time to comment.